Mr Bush Jr, himself a former president, described him as “a noble man, the best father”. 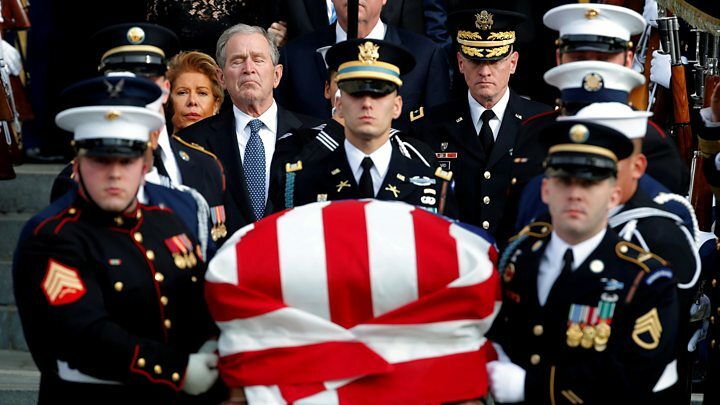 In his eulogy, George W Bush said his father had taught him that “public service is noble and necessary”. “He accepted failure is part of living a full life, but taught us never to be defined by failure. He showed us how setbacks can strengthen,” he added. What happened at the funeral? The invitation-only funeral at the National Cathedral was attended by President Donald Trump and his predecessors Barack Obama, Bill Clinton and Jimmy Carter. The Prince of Wales, German Chancellor Angela Merkel and Jordan’s King Abdullah II were among the world figures there to pay their respects. Former leaders, including John Major, who was UK prime minister for most of Mr Bush’s term, also attended. Wednesday has been declared a national day of mourning – many government offices and US stock exchanges are closed. Following the funeral service, Mr Bush’s flag-draped casket was carried from the cathedral by a military honour guard and was later flown to Texas, arriving in Houston at 23:00 GMT. The casket will lie in public repose at St Martin’s Episcopal Church until Thursday morning. 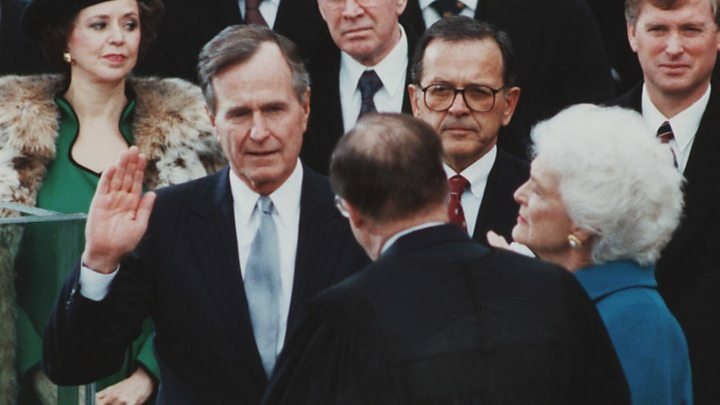 There will be a second service before the Bush 4141 – a train which was named in honour of the president – takes his body to its final resting place, next to his wife Barbara at the George HW Bush presidential library. Jim McGrath, who was Mr Bush’s spokesman, said the president had once wondered if anyone would attend his funeral. What other tributes were paid? Presidential historian Jon Meacham described Mr Bush Sr as “America’s last great soldier statesman”, recounting how he had served as a US Navy pilot in World War Two and survived after his plane was shot down over the Pacific. “His life was a perennial effort to prove himself worthy of his salvation on that distant morning,” he said. What is Bush Senior’s legacy? Former Canadian Prime Minister Brian Mulroney praised Mr Bush Sr’s role in navigating the end of the Cold War. “When George Bush was president of the United States of America, every single head of government in the world knew that they were dealing with a gentleman, a genuine leader, one who was distinguished, resolute and brave,” he said. © 2018 Malayalam Business Times. All Rights Reserved.